GAC's newest show, hosted by Lyric Street Recording artist Aaron Tippin, takes you up close and personal with some of the companies that make America what it is today. Tippin will travel across the United States to visit the headquarters of well-known companies like Corvette, Southwest Airlines, Chris Craft, Jack Daniels and Louisville Slugger, featuring the products, history and people who make it all happen! PLUS, Aaron will introduce some of your favorite videos along the way! 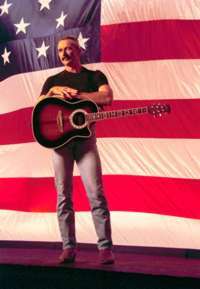 What better host for GAC's new "Made In America" show than Aaron Tippin's career was launched under a banner of patriotism when his debut single, "You've Got to Stand for Something," reached the Top Ten in 1991 and became an anthem for a nation embroiled in the conflict of Desert Storm. Aaron quickly became a voice of patriotism, a badge he wears proudly and has carried with him throughout his career, a career where he sings what he knows about most - strong family ties and hard work. Family has always been important to Aaron, who cites his father as his biggest hero. Aaron was raised on a farm in South Carolina; his chief influences included Jimmie Rodgers, Hank Thompson and Lefty Frizzell. He began playing guitar and performing when he was ten. By the time Aaron was 20, he was working as a commercial pilot. In 1986, he moved to Nashville, where he eventually became a staff writer at Acuff-Rose. He signed his first recording contract with RCA in 1990. Aaron's hard-edged twang is one of the more distinctive sounds in today's country music today! Catch a new episode of "Made In America" debuting Wednesdays at 4pm ET! "See The World In A New Light" with Aaron when he visits Sylvania!